Do you ever have those slap on the forehead Ah-Ha moments? I had one of those the other day when I saw a post on canning carrots. 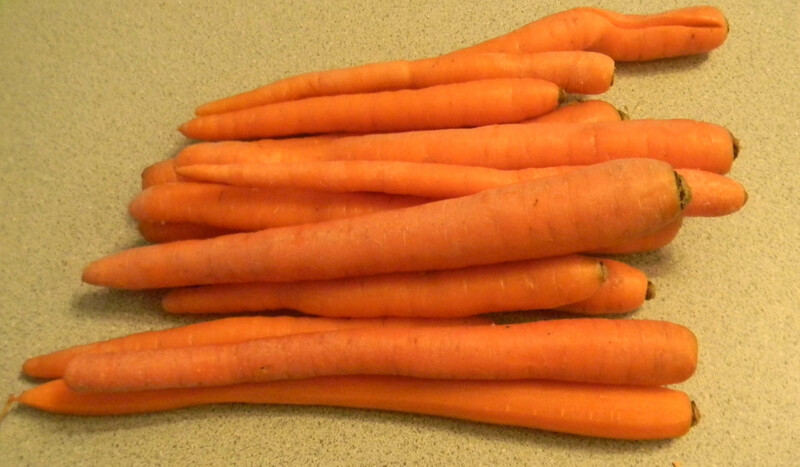 I grow carrots but, never enough for juicing which I try to do every day. I also use carrots in soups, stews, stir fry’s and occasionally for a meal. However, I NEVER thought of canning carrots. Because I never have enough carrots I purchase the 5lb bag of organic carrots from BJ’s. So the other day I purchased an extra bag and canned them. I was able to get 14 – 1/2 pint jars (this is what will fit in my pressure canner) and had quite a few carrots left over for juicing. A couple of days later I purchased another bag and after canning I had just 3 or 4 carrots left over. I am not sure if the weight was off or it was the size of the carrots, the first bag had larger carrots. Canning instructions link below. When I picked up the 2nd bag of carrots I found a 4lb bag of frozen organic corn and purchased it because organic corn is hard to find. When I arrived home I scoured the internet for instructions on canning frozen corn. I could not find a thing. When a post on my Facebook popped up on freezing corn I asked if anyone had canned frozen corn before. I had one response to the post saying yes, they had canned frozen corn and it worked out fine. So I decided to can the corn just like it was fresh. I again ended up with 14 – 1/2 pints and probably 2 -1/2 pints left over. After canning I tasted the corn to make sure it was not mushy and I was pleasantly surprised that it tasted better than any canned corn I ever had before. Was all this worth the cost? You decide. The cost of the canned carrots ended up at $.21 a can and the corn was $.40 a can (not including the jars). Because it is just my husband and I 1/2 pints work out great. I was just at BJ’s and checked for prices. I didn’t spot any carrots but, the canned corn was $.87 a can for for 11 oz and it wasn’t organic. So price wise canning is the way to go for me. I know some of you will ask why don’t I just keep the corn frozen. The answer is I live in Florida and I have very little freezer space. We have lost electricity several times with storms and one time lost a whole freezer full of food after being without electricity for about 3 weeks. I use this website all the time for information about canning times and pressure amount. I did however, place the corn into a colander and rinse with cool water before canning. I purchase my jars at Wal-mart and use most of the pieces from this set at Amazon. This is the pressure I use. Click on pictures for links. I am an Amazon Affiliate and if you purchase from the links I may receive compensation. This however, costs you nothing additional. 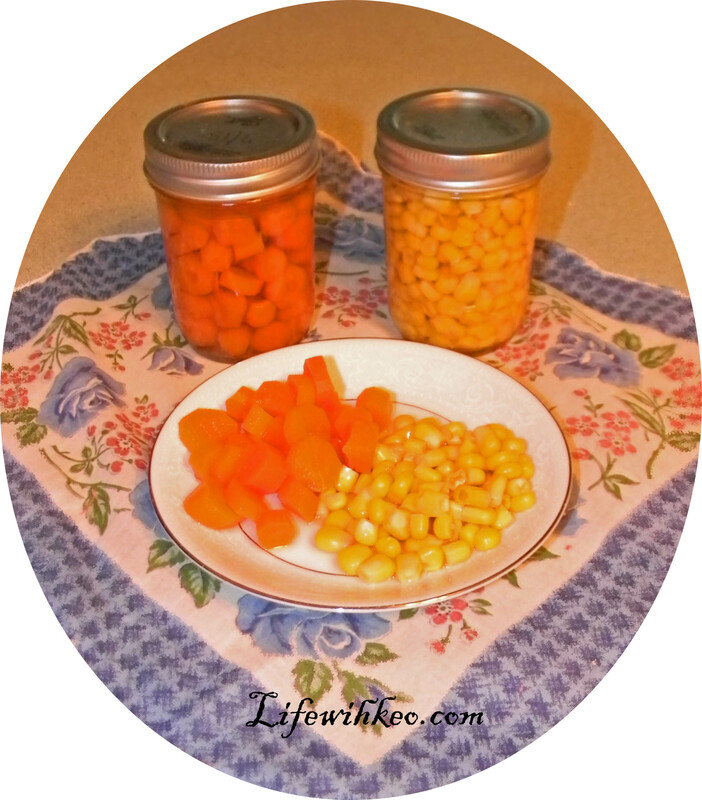 This entry was posted in canning vegetables, Posts and tagged canning, canning carrots, canning corn, canning frozen corn, canning vegetables. Bookmark the permalink.